There are days…. there are weeks…. that I am just…. happy…. 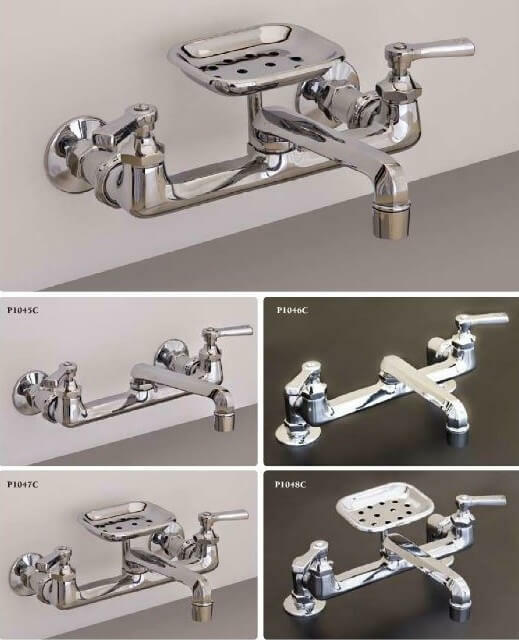 that there are companies like Bathroom Machineries, also lovingly known here as deabath.com, that care enough about wonderful old stuff that they do things like: Cast their own faucet base thingies just to fit vintage Crane kitchen sinks. See it in the photo, above? It’s the chromed plate out of which the faucet and sprayer emerge from the plumbing pipes below. Oh, and more on The Happy: And then, there are places like the Building Technology Heritage Library, and folks like MBJ, that scan old catalogs so’s I can try to find out which sinks, exactly, these chromed covers fit, and what years they were made. 1948-49, it seems. 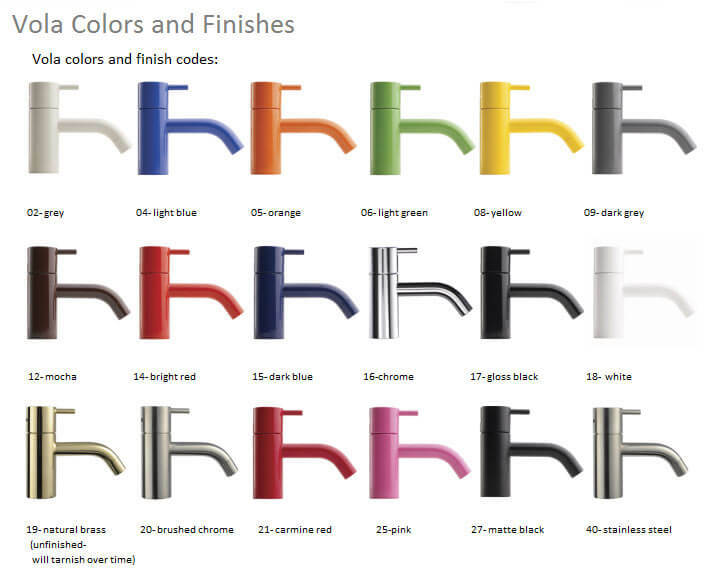 Crane Kitchen Faucets with Plastic plate: Plastic faucet mounting plate over a large rectangular hole in the sink. We’ve cast a replacement in both brass and aluminum. 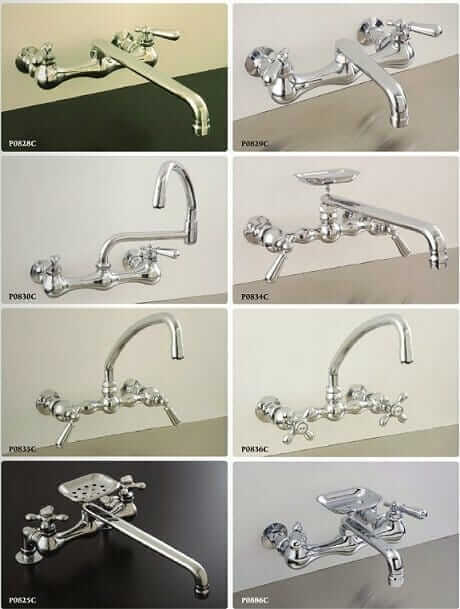 Replacement faucets for this sink configuration simply do not exist, for the plate to work properly, one MUST have the original faucet as the plate is supported by the faucet. Get ’em here, noting, this level of attention to detail — to sink salvation — does not come cheap. 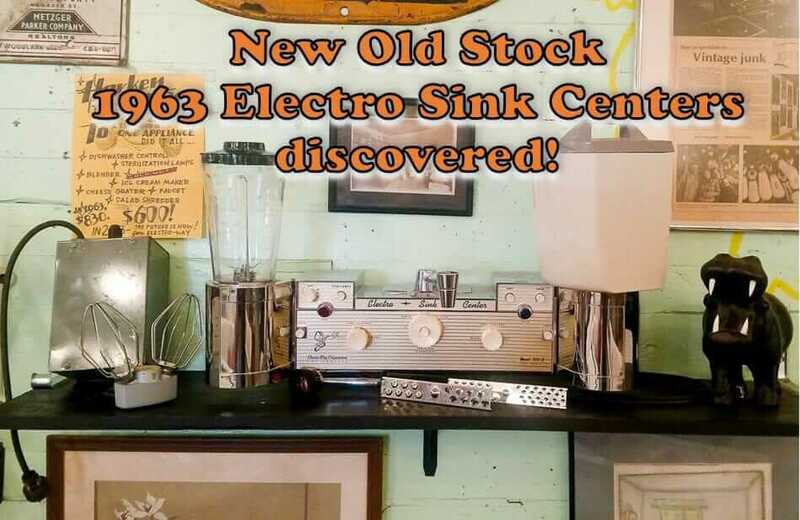 A bunch of New Old Stock Electro Sink Centers for sale ! Vintage homes are right up many buyers’ alley – youngsters who are done with apartments and want a backyard especially if all the accoutrements (established garden, clothesline, patio with brick grill, etc.) are already in place, divorced/widowed/single women, those who don’t like/can’t afford/don’t see the point in over-priced McMansions with too many restrictions and not a stable neighborhood…People who wonder why they’d have new construction or remodel using new retro fixtures (Sputnik, flying saucer) when the original is already there in a Mid-Century home. This stuff was built to last and DYI’ers are seeing the value in at least trying to fix it before just going out and buying new. Earth Day and Reduce, Reuse, Recycle – finally coming into season. I love your optimism, Carolyn, and couldn’t agree more with the rationale expressed. If only the hyper tear down and flip market in my Chicago burb could get with the trend that does appear to be starting in some areas, one more irreplaceable gem could be saved for those of us who love them! I guess it depends on where you live. I still browse the real estate listings and it seems that there is a lasting trend in my area of buy an older home, tear out all the vintage stuff, take out several walls and fill it with big box store stuff. Then as mandatory paint every wall gray and put it back on the market as “completely updated”. 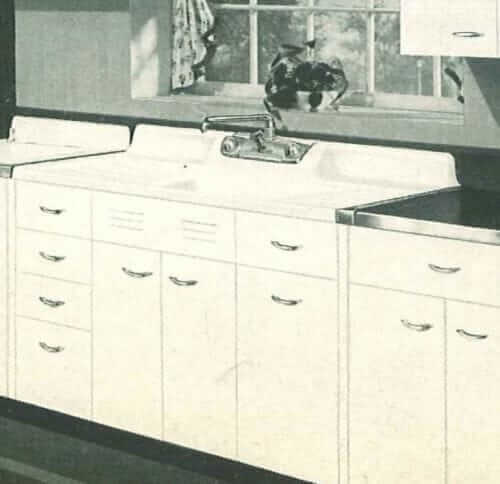 But I am so grateful for companies that still make things for vintage faucets, sinks etc…because I need handles for my American Standard Gracelynn sink. Maybe folks will start to hang onto the old stuff if parts aren’t so hard to find. We can hope. Carolyn describes just how I felt when I bought my current 1949 house. I grew up in a 1910-1930 neighborhood that bordered on a post-world war 1945 neighborhood. As I child I marveled at the architecture and patio life style of my childhood friends in their newly built mid-century houses. Now I am living in one. What I see in the Dallas area is generally more like what Lisa describes, and it’s so sad. It happened to a wonderful (at one time) house right across the street from me, ruined inside and out. There’s more preservation in the hipper areas of town, like Oak Cliff, but even then, it’s pretty rare to see a kitchen that hasn’t been gutted and given the generic white-gray-stainless steel treatment. So many people have been indoctrinated to think they MUST do this to sell the house! One ray of hope: the easier it is to find replacement hardware, the less likely those tear-outs will be. So for that I thank you, Pam!